When I was in the business of summarizing The Artist of the Missing to strangers, in the months before and after it came out, I gave a different account of it nearly every time. If all the people who asked me, “So, what's your book about?” had got together in a room and compared notes, they would not have believed that all these descriptions were of the same book. Although probably all of the descriptions, collated, would have summed it up pretty well. The Artist of the Missing is about a city where people disappear, a man who paints their portraits, some police officers, a forensic photographer and a very lifelike doll. Dark and elliptical, it won a California Book Award for the best first novel of 1999. 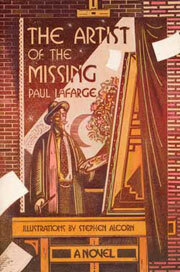 You can orderThe Artist of the Missing from Amazon or Barnes & Noble.